Who is being reasonable now? The estimates look like characteristic “tell-tales” of a company running strong into the wind. This conservatism in the face of rapid growth sounds “reasonable” but is it always practiced? And what about the ability of this conservative strategy to predict dramatic changes in growth? To test, we started to look at the predictions for RIM. 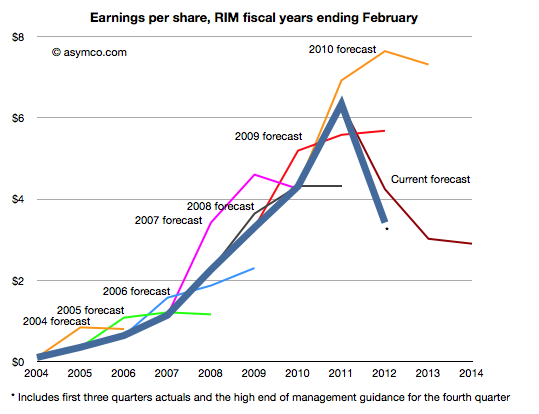 RIM has also enjoyed strong growth over a similar time frame as Apple. How did analysts predict its performance? The following chart was prepared using the same technique as the one for Apple. Surprisingly, the “tell-tales” look very different. For every year we looked at the first year estimates were over-optimistic with a decline expected after one or two years. This pattern is remarkably consistent within the RIM data and remarkably inconsistent when compared to Apple. It’s as if there was nothing in common with the methods used. This is perhaps appropriate, but the “quality” of predictions are not much better. With RIM they were too optimistic in the short term and too pessimistic in the medium term. 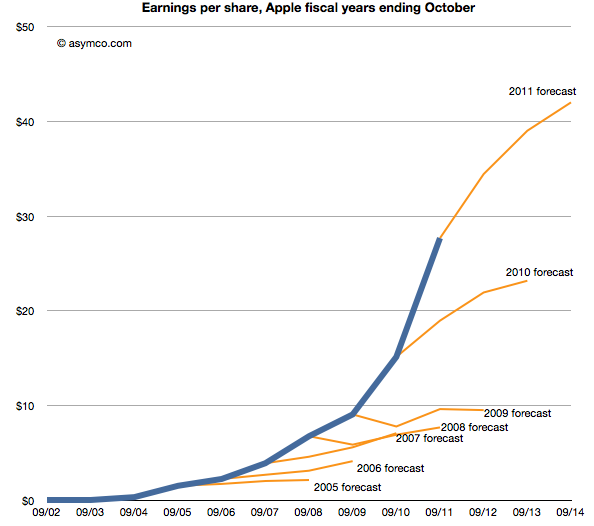 With Apple they were far too pessimistic consistently. More worrisome, the 2010 forecast did not offer any hint of the dramatic decline which followed only a few months later. And after three quarters of really bad news, the consensus is still higher than what will likely happen (ensuring an uninterrupted string “misses”). The study of these two companies’ forecasts is a study in contrasts. We can say that the forecasting is disturbingly consistently inaccurate but we can also say that there seems to have been a bias of pessimism for Apple and optimism for RIM. We can only guess at the cause, but the consistency of bias points to something institutional. The three year forecast consensus (sourced from Bloomberg) was sampled one month following the end of each fiscal year. This should offer the analyst enough time digest the year passed and deeply contemplate the future. If we may stretch the analogy, these are indicative of an imminent stall. 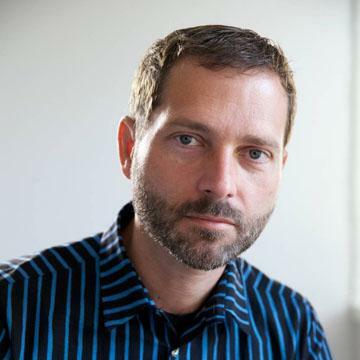 › Next Post 5by5 | The Critical Path #18: Who's Paying for My Lunch?